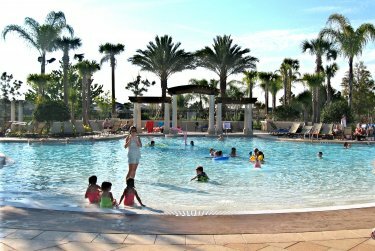 Only 1 � miles from Disney World, Windsor hills is considered a premier resort community. This well appointed property boasts every amenity necessary to ensure the perfect luxury vacation. It is perfect for families large and small and groups of any age. Guests will especially enjoy the private screened in pool with cascading spa. 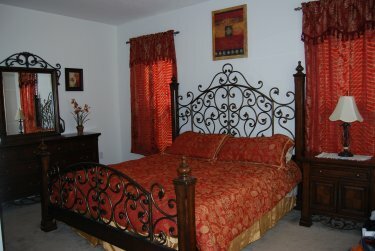 The home also offers TV/DVD in every room, large screen TV in family room, 8 ft. pool table in the game room and WIFI. Take a break from the theme parks and spend a day relaxing at the beautiful clubhouse. The clubhouse features a zero depth pool with water slide, dancing fountain, fitness room, game room, Movie Theater and sundry shop. 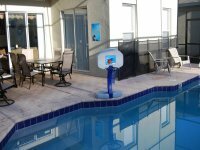 Windsor Hills also offers fabulous playground areas, tennis courts, basketball courts (equipped for nighttime play), putting green and sand volleyball court. Come and enjoy a vacation get away you will never forget.